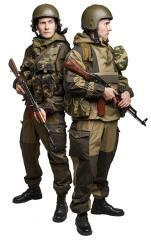 The loose fitting Gorkas are a commonly used by Russia's more elite fighting units. These are not made for the parade grounds, but developed to be purely practical. We sell the trousers and jackets separately. Here's the jacket. 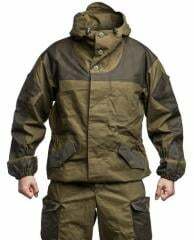 Hugely popular in Russia among all kinds of outdoor types, not just military, the Gorka should serve those well who are looking a simple, robust garment for field use. Roomy cut for unrestrained movement & extra clothing. Materials used are cotton, nylon and a mix of both. Buttons up at the front, a storm flap on the inside offers extra protection when needed. 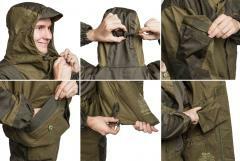 Pockets, wrists and elbows are reinforced with an extra layer of a hard wearing nylon blend. Elastics on the sides and wrists. Five pockets, two on the hem, two on the sleeves and one inside pocket. Roomy hood with well adjustable tightening cords. All in all there isn't a thing you couldn't repair if you own buttons, a needle and thread! 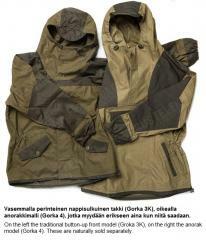 The Gorka is made from a base layer of cotton, in the style of the old Plash Palatka rain capes. The Gorka is water repellent to some extent when new, but not a straightforward rubbery rain suit, thus it breathes well. Still, do not treat this as a waterproof garment - it isn't one. All hard wearing areas are reinforced with a strong polycotton blend, either ripstop reinforced or not, this varies from one suit to the other. This suit is meant to protect the wearer from wind and weather, it's not lined in any way which makes it wearable both in the summer and winter. 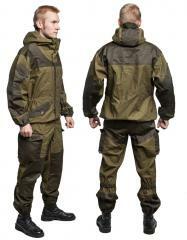 It's recommended to wear appropriate layered clothing or a field uniform underneath. First the traditional Russian size, then the same converted to centimetres - recommended height and chest circumference. The cut is generous both length and widthwise, so don't sweat it when picking sizes. A size 50 (Medium) person should do well with anything from 48 to 52. The vast majority is made by a company called Bars, but once in a blue moon there might be some others mixed in as well (Siluett or Blok-Post etc.). All are virtually the same. But in 99% of the cases you'll get a Bars made product. Availability is a bit unpredictable - we can't give any estimates of restock. Likewise, no idea about the sizes we get. What we do know is that the amounts are small. 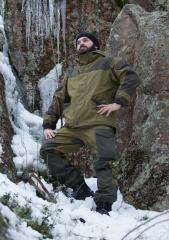 The Gorka 3K outfit is perfect for the outdoors and trekking. The material is sturdy, especially the reinforcements (which are in all of the right places), while still being relatively light. As an outer suit for winter trekking it can handle snow quite well; however, you'll need some extra layers underneath since there isn't much in terms of lining. The colour of the original Gorka (olive green and dark greenish-brown reinforcements) means that it can get quite dirty without actually looking dirty. I've wiped my dirty hands on it plenty of times while handling ashes, etc, and it doesn't look bad at all. In general it's quite a nice suit - ”foresty” without being covered in camo, well-fitted, and sturdy to boot. The coat and the trousers work well together or as stand-alone garments. The cut of the coat is quite nice. There isn't a lot of extra material that would lead to baggy arms or a ”tent”-like feeling, or a hood that feels like you have your head in a cavern. The collar is quite high which adds extra warmth around a neck gaiter or scarf, and the hood has plenty of adjustments to get the fit just right. I originally took the size 3 (I'm 173), but the sleeves felt a little short ending just above my wrist, so I've gone up to a size 4 for longer sleeves. Front pockets are decently spacious, and even with the button open things don't fall out easily. The sleeve pockets are a tad small, but they'll easily hold tiny trinkets such a lighters or matches. The trousers are probably my favourite part of the whole suit. The fit is nice while still being roomy. The legs have elastic around the calves and ankles, as well as reinforced fabric, leaving less loose fabric to get caught on whatever you might encounter in the forest (or battlefield?). The seat is reinforced, which came in handy when I slid down an icy hill in the early spring. Well, it was either that or risk walking down (and probably end up sliding down anyway). It comes with belt loops and suspenders, but personally I use a belt since I can hang a knife and canteen from it. It's nice to have options though. The trousers also have plenty of storage space. There are largish front pockets as well as cargo pockets. The latter have a nice closure system in which the pocket mouth folds over onto itself, making a seal to ensure that losing something will take one hell of an effort. Especially if you have to do some extreme hill sliding. Erinomainen takki ympärivuotiseen ja joka päiväiseen käyttöön. Pitää pienet tihkut sekä tuulet ulkona ja lämmöt sisällä. -26 tuulisessa kelissä pelkkä lampaanvillapaita alla tarkeni mainiosti. Tyylinsä puolesta kelepaa sekä mettään että kaupunkiin.